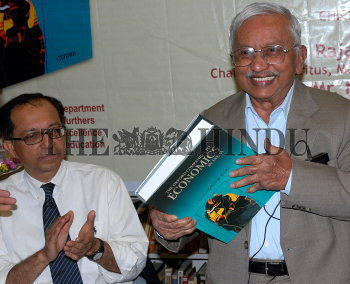 Caption : Professor Raja J. Chelliah, Chairman Emeritus, Madras School of Economics releasing The Oxford Companion to Economics In India book at British Council on February 23, 2007.. The Author of book Kaushik Basu, Professor of Economics, Comell University, USA. is seen at left Photo : M_Vedhan.